Re-reading a classic work of literature can lead down unexpected bypaths. In my case, I can’t claim the re-reading was premeditated. In fact, as I settled my tender loins against the hard, wooden bench, a book was not on the front burner. My wife, Nicole, had an appointment. Since we were together, I hunkered down to wait for her. The appointment ran long and turned into a two hour sigh fest – or could have. Across from me sat an oblivious couple of flat-bellies, early twenties, deeply engrossed in their I-phones. I deftly whipped out my Android phone, recently acquired, and spent a few minutes fumbling aboard the internet. I still felt pretty cool. This amused me for a little while but being well-seasoned I soon looked around for something printed to read. Nothing. Frustrated, I played more with the phone and noticed the pre-loaded “Books” application. I opened it and my phone offered me a selection of Google-scanned free classics, one of them being Dickens’ Great Expectations. I selected it and my e-reading adventure began. The text was easy to read and “turning” pages required only a simple swipe of my thumb. This hard wait got me off to a flying start with my Great Expectations. Nicole gave me a quizzical look when I told her I’d been reading and had no printed book in hand. I showed her my new toy. Disbelief. Denial. You are a book man, she said. Her discontent only got worse when I sprawled in bed at night, lights completely off, and read of Pip’s adventures under the glow of a Thunderbolt phone backlight. Dickens’ novels are not known for their brevity. My Expectations didn’t wear off, but certainly did wear on. As I thumbed the text, the number of typographic errors, wrong words, and garbled paragraphs assaulted me regularly. It appeared the book had been scanned by a minimum wager having a bad day and proofread by his nepotistic nephew. Some of the errors were minor; others actually disrupted the meaning of the text--nothing like having to guess what Dickens actually wrote. These textual hiccups soon had me thinking of another great English writer, Shakespeare. (This is how a bookman’s mind works.) No manuscripts of Shakespeare’s plays exist. The earliest printed editions of his plays, both individually pamphlets called “Quartos” and the first collected Folio edition of 1623 have many textual variations among them. The “bad” quarto editions of his plays were apparently constructed from actors’ memories, second hand scripts, etc. These mostly-pirated editions were sold cheap by opportunists to the masses. Even the First Folio, edited by Shakespeare’s friends after his death, has many variants within the printing. A scholarly industry developed in the 19th and 20th centuries to sift through the textual discrepancies of Shakespeare and other writers in order to identify what the authors had actually written. These stories of bibliographic investigations and battles over interpretations can range from dry slogging to damn interesting reading. Of course, book collectors have played a crucial role in gathering and saving the texts. Many noted textual scholars, if not collectors themselves, were incredibly good bookmen and women, most of them based in a university setting. I have found no information about Google’s apparently proprietary estimates. But what’s a missing page or two between readers? Bowers and Hinman were number crunchers when it came to statistics and sticklers for details. They would have surely liked to see the basis for Google’s enjoyment meter. 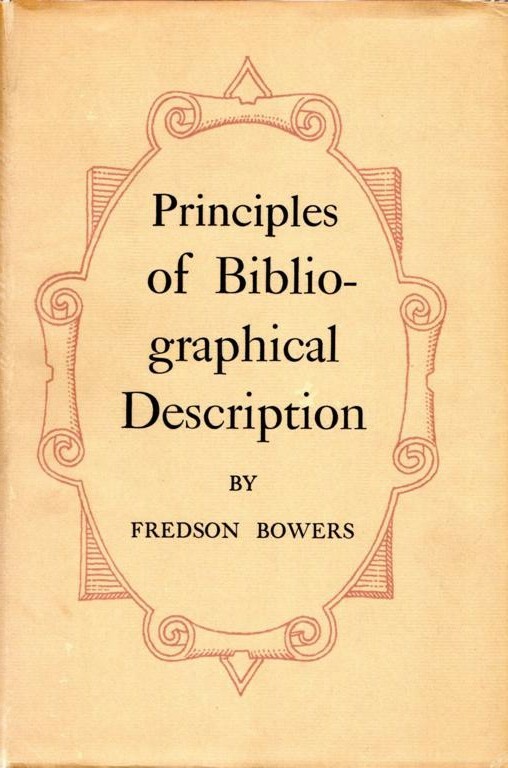 Fredson Bowers wrote the classic Principles of Bibliographical Description (1949). This work expanded on Ronald McKerrow’s An Introduction to Bibliography for Literary Students (1927). These are heavyweight references designed to reveal and codify the innards of the bibliographic process. 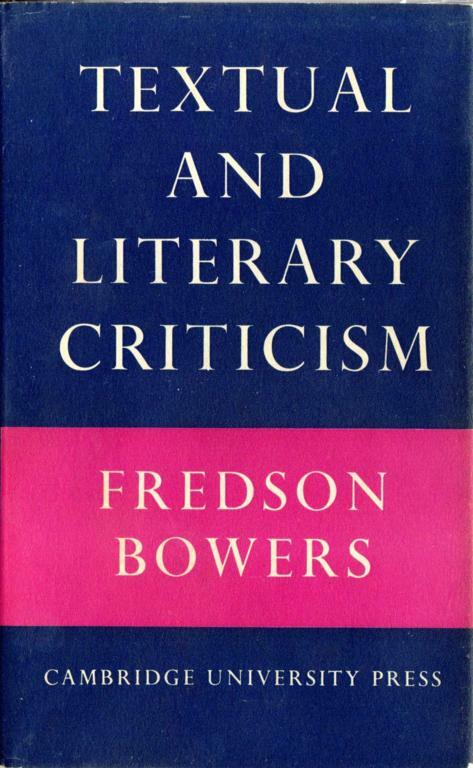 Bowers’ work in particular was a challenging read for even the experts. I have before me the heavily annotated copies of both titles that belonged to famed bookman, John Carter (author of Taste and Technique in Book Collecting, Books and Book-Collectors, ABC for Book-Collectors, etc.). Carter confided to a fellow book master, William A. Jackson of Harvard that it took him four stiff drinks of bourbon whiskey to make his way through the Bowers bibliographic formulas. 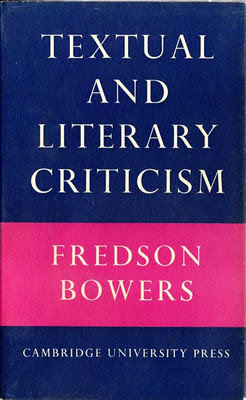 A more accessible Bowers publication relates directly to textual studies, Textual and Literary Criticism (1959) based on a series of lectures. 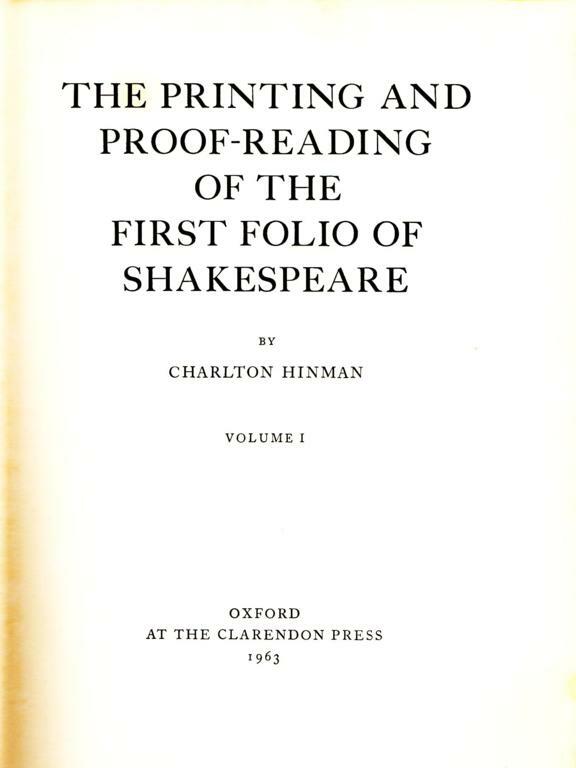 I am fortunate to own the copy of Charlton Hinman with his annotations throughout the important essay, “New Textual Criticism of Shakespeare.” Bowers mentions Hinman and his preliminary research a number of times in the essay and refers to the brilliance of his work. This brilliance would find expression in Hinman’s The Printing and Proof-reading of the First Folio of Shakespeare (1963). Hinman’s book germinated during his WWII stint as an intelligence analyst. Coincidentally, Fredson Bowers was his commanding officer. 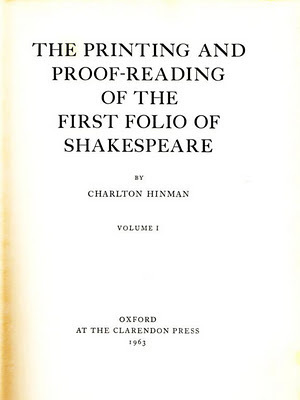 Using a collation machine designed by himself and inspired by his service in the military, Hinman performed a page-by-page comparison of over fifty copies of the First Folio of Shakespeare at the Folger Library in Washington, D.C. (kudos to Henry Folger for collecting them). His results reshaped Shakespearian scholarship and heavily influenced the general course of bibliographical studies. Hinman’s methods, often imitated afterwards, led to discoveries in textual variations of other authors, printing history and the publication process. His book is one of the greatest achievements in the field of analytical bibliography. 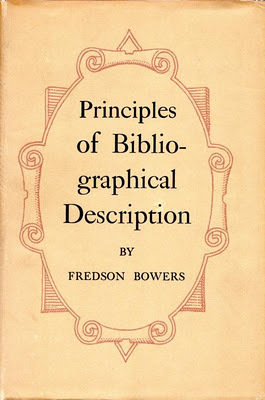 Today the work has its supporters and detractors as the field of bibliography has continued to develop, but the book remains a bibliographical monument. So, as you can imagine, I was very pleased a number of years ago to acquire Hinman’s own heavily annotated copy of The Printing and Proof-reading with correspondence laid in. One of the perks of these essays is to revisit such books on my shelves. Okay, I shall put it down now and continue. So my tender loins, a hard wooden bench, and an Android phone application have led to all this revelation and irritation. Plain sloppiness is inexcusable when an important work is digitized and provided to potentially millions of future readers without nary a basic proof read let alone a careful editing. But perhaps there are deeper forces than sloppiness at work. As Pip learned in Great Expectations, hubris has its consequences but redemption is possible. Let us be optimistic. Kurt have really enjoyed your blog to date; this novice greatly appreciates the detailed information and history you provide. Keep up the good work.